Row Covers, Cold Frames, Hoop Houses and Other 'Cool' Ways to Extend the Season | Gardens Alive! First, DO IT! It's not that hard, and it's very rewarding. Two: Whatever size you think you need, DOUBLE IT if you have the space! A. Thanks. Daryl—as you have discovered, season extension is highly addictive; once you start you'll never stop! For the uninitiated, hoop houses are simple structures made of clear plastic (typically 6 mil thick and UV resistant) stretched over rows of big hoops tall enough to walk under, with end pieces that can be closed tight. (Some styles feature actual doors on the ends; others just have plastic that can be tied shut.) As Daryl notes, they offer many of the advantages of a greenhouse at a fraction of the cost. Hoop houses enable gardeners anywhere to get crops like tomatoes and cucumbers going a good month early. When the weather starts to get warm, roll up the sides during the day to allow airflow and venting. When it gets really hot, roll it up all the way; or remove the plastic entirely and store it for the Fall, when you can enclose again for another extra month of growing. My old friend George De Vault, now President of the Seed Savers Exchange in Decorah, Iowa, couldn't build new ones fast enough when he was organic farming in Pennsylvania. "You can farm in the rain and the snow!" he marveled. "Your tomatoes stay nice and healthy because the overhead cover keeps their leaves dry. And a hailstorm may only mean you have to replace plastic, not all of your crops. Growing things out in the open is SO 20th Century." And yes, Daryl, you can certainly drag a pic-a-nic table inside and start your seeds in the hoop house; and with the ends closed up, you won't NEED a heating mat! A. The ready-made cold frames I've seen would fit on top of a raised bed nicely, Bob! Cold frames—essentially just open-bottomed boxes with glass or clear plastic lids—are great for starting seeds and growing salad greens over the winter, but can heat up quickly on cold but sunny days. Gardeners who rely on "remembering" to raise and lower the lid are shooting craps with broken dice, so go for one with an automatic vent. It'll pop the top when it gets too warm inside and lower it back down for protection from the evening cold. Otherwise, just drop the box right on the surface of one of your beds, or excavate a small area and sink the box down into it for extra insulation. You can even make a "French hot bed" that stays warm at night by putting a couple inches of fresh horse manure in the bottom of the hole, covering it with a few inches of soil and planting on top! Just make sure the manure is well covered with soil; it's fine if the plant roots reach down into the 'doo', but you don't want any on your lettuce leaves! Q: I'm using Reemay to protect my Alaska garden, which gets morning sun, but only on the few sunny days we get. When should I remove the row covers? I worry that they block too much sunlight and/or warmth during the day. Thanks. A. "Reemay" is actually one of many brand names of 'floating row cover.' These rolls of spun polyester fabric are draped like blankets over crops, mostly to protect them from frost, but they can also be used to keep pest insects off. Inexpensive, reusable and highly effective, row covers never 'need' to be removed. They're designed to keep frost and bugs out, but to allow light, air and water through. And they actually capture and hold a little heat underneath, making their plants warmer, not cooler. They also come in different thicknesses, so you can use heavyweight covers in the coldest weather and lighter weight ones when the weather is warmer. The lighter weight covers allow the maximum amount of sunlight through and trap less heat; although overheating is pretty much unheard of with these diaphanous blankets. 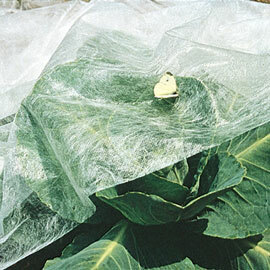 Gardeners in cool climes can use row covers to protect cool-weather lovers like salad greens long into the Fall, perhaps through the entire winter if your climate isn't bitter cold and Mother Nature doesn't decide to give you a whipping. 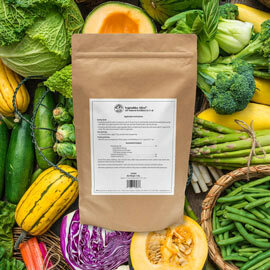 In the Spring, they can be used to warm the soil for early planting of crops like peas and greens. Anchor their edges in the ground with soil or little stakes, and they'll protect vulnerable plants from pests early in the season—like flea beetles on eggplant and cuke beetles on…well, cukes. 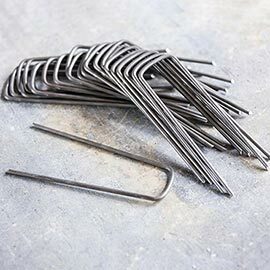 If pests are a serious problem, get some flexible metal or fiberglass rods or buy ready-made hoops and make little hoop houses that the covers can float over when the plants get big. The covers DO need to be removed from flowering plants once lots of blooms are open for pollination (or you can lift them and hand-pollinate the flowers). But they can protect crops that don't get insect pollinated, like kale, lettuce, spinach, cabbages, broccoli and the like all season long. Note: I'm mostly just a reporter here. I've had greenhouses and fooled around with row covers, but have come to enjoy taking the winter off. The master of season extension is Eliot Coleman, who (along with the lovely and talented Barbara Damrosch), grows crops for market year-round in chilly New England without artificial heat. He reveals lots of his secrets in his fine books and at the farm's website.